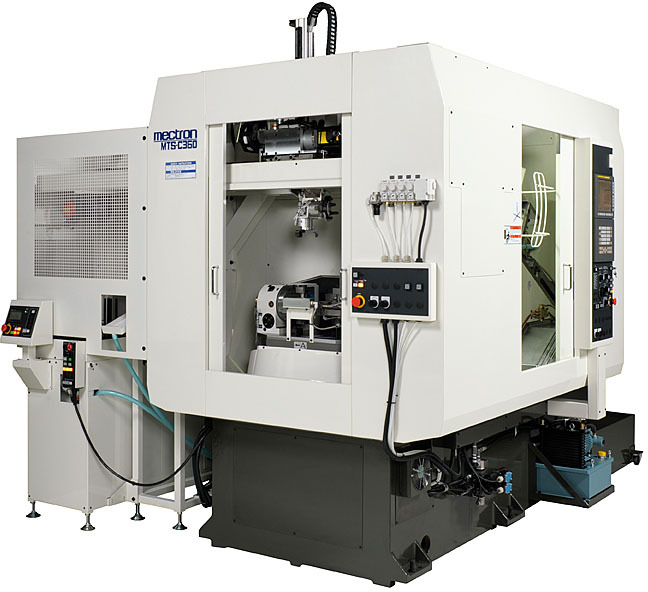 All round type and one rank higher machining capability. 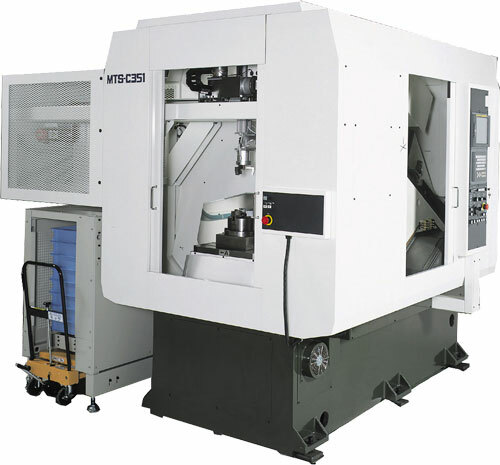 30°slant structure with spindle (Y & Z axis) realize ideal cutting chips disposal. Twin turntable is equipped as standard. At the machining side, 30°slant table makes easy chip flow. On the other hand, at the front loading side, the table is leveled for easy mounting jig and workpiece. Even standard motor, 1.4 times more high torque compare with MTS-C351. 2 times more high torque motor is also available as option. 12 tools ATC (Max. 15 tools) with AC servo-motor is used for smooth and fast rotation. It is maintenance free design from any sensor trouble. The slant structure create more loading space for all kind of automated application. Thanks to new feed motor, the machining performance is improved. Positioning time is shortend 50% compared with former model machine. 63.6 x 106.3 x 86.0"
Thanks to slant spindle structure, the specialized gantry loader can be attached on the loading side table easily. It is possible to make loader program the same as ordinary NC program. It can be displayed on the LCD screen and stored NC memory. G code numerical direct command is used for positioning. Various type of work stocker can be attached. Note: The specification are subject to change without notice. Machine in photo may not be exactly same as actual products.